1/64 scale steam locomotive captured with Sony A350’s tilt-out live view system. Jan 21, 2009: For the last several years, I’ve taken the grandkids to see the “trains, trains, trains” exhibit at the Kings Mountain Historical Museum. Held each December, the event is put on by the Carolinas Division of the Atlantic Coast S-Gaugers. S-gauge is a model railroad term that indicates the scale of the model trains; larger than HO scale but smaller than the O-Gauge rolling stock from Lionel and other makers. American Flyer is the best known maker of S-Gauge rolling stock, but manufacturers like American Models, S-Helper Services and others produce compatible 1/64 scale locomotives, cars, track and accessories. Naturally, I always haul a camera to these events. This year, the choice was the Sony Alpha A350. I figured the Live View option on the A350 would come in handy. I was, however, surprised how great the adjustable LCD screen proved to be for this type of work. By placing the camera right on the layout and composing with the LV screen, it was like I walked right into the scene. I’ve shot models at various times in the past, but the A350 Live View opened a brand new dimension for me. The Carolinas Division of the Atlantic Coast S-Gaugers has created a large layout table, with two tracks running around the perimeter. While the trains are the centerpiece, there are dozens of buttons arranged around the table. Each button triggers an animated display of some sort. One button might cause a building to light up, while other buttons trigger railroad sounds, a plane to swoop over the layout or some lumberjacks to saw away at a fallen tree. You can spend hours experimenting with the buttons, but for a photographer, the layout offers a host of wonderful subjects. Live View allowed me to capture some interesting viewpoints that I missed when shooting in the past. By flipping the A350’s LCD into the horizontal position, I found I could aim directly down the track at an approaching locomotive. Choosing a vantage point outside a curve let me compose a head-on shot, secure that the train would swing away before it hit the camera. Check out the model train image gallery to see how the A350 performed. Shooting in this manner, I did encounter one of the limitations of the Live View system. Like most electronic view finders (EVF) the Sony Live View LCD can’t show you an instant preview. There is a slight lag between what you see on the screen and what is actually happening. You can prove this by moving the camera quickly from side to side. You notice the image on the LCS screen will look smeared, because the LCD can’t refresh quickly enough. In the case of the train heading directly at the camera, I found I had to shoot slightly before the locomotive looked in focus. 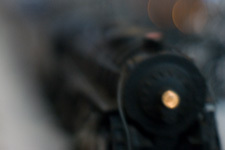 If I waited until the front of the engine was perfectly focused on the LCD, the train would be unfocused in the actual image. Because of the shallow DOF, the engine would move beyond of the zone of sharpness while it still look perfectly focussed on the LCD. Once I understood what was happening, I was able to significantly increase the number of in-focus, head-on shots using the LCD. Shooting models (not that kind of model…we’re talking toy trains here) is always a challenge, due to depth of field issues. If you read the my basics article on depth of field, you know that the closer your lens gets to a subject, the shallower the depth of field will become. It is tempting to use a macro lens for this type of shooting, but with a macro lens the DOF is so shallow that only a very slim part of your subject will be in focus. Even without resorting to a macro lens, you’ll probably notice very shallow DOF. Usually I would stop the lens down to create more DOF. However the trains at the King’s Mountain Exhibit were always moving. This led to an interesting dilemma. If I stopped the lens down, the shutter speed became too slow to stop the moving trains. Opening the lens up to the maximum aperture gave me a sufficient shutter speed to prevent the trains from blurring, but the DOF became too shallow to display an entire locomotive — let alone an entire train. I tried some flash images, with a hand held Minolta 4000 AF flash cabled to the Sony A350. By hand-holding the flash I could aim it in various directions to get some interesting, shadowless light. This gave me some decent DOF and effectively froze the motion of the trains. Actually the flash was too effective in freezing the motion. The 4000 AF stopped the locomotives so well that they appeared static. If I was going to shoot with the flash, I might just as well have asked the guys from the Atlantic Coast S-Gaugers to stop the trains so I could shoot them while they were not moving. I could have upped the ISO, which would have allowed me to shoot at faster shutter speeds with the lens stopped down. However, I was concerned that this would increase noise, which might obscure some of the fine details on the models. So I tried a variety of shooting techniques. I scrapped many of the captures because they didn’t work out. But I got a few I really liked, and there were enough interesting ones to create a nice magazine or newspaper spread. Take a look over the gallery and tell me what you think. After shooting the layout with the Sony A350, it is hard to imagine photographing this kind of subject with any camera that doesn’t offer a tilt out LCD. This entry was posted in A350, Alphatracks Visits, DSLR, Photography, Sony A300, Sony DSLR. Bookmark the permalink. Post a comment or leave a trackback: Trackback URL. Love your photos and the subject matter. BUT. If you’re using a DSLR why not use the viewfinder rather than the LCD screen? If you were to use the eyepiece there’d be no lag so you could catch your photos pretty much as you see them. I’m new to trains and I love ’em. Even the amateur can locate the web site of the particular business in which he is interested and can collect the needed info. The stock broker can guide the newbie within the present scenario of stock exchange and may perhaps give some predictions and ideas about next couple of days of trading trends. As the stock exchange is not steady, the new investor really should watch some swings and roundabouts and try and research them making use of the study techniques they have picked up thus far.